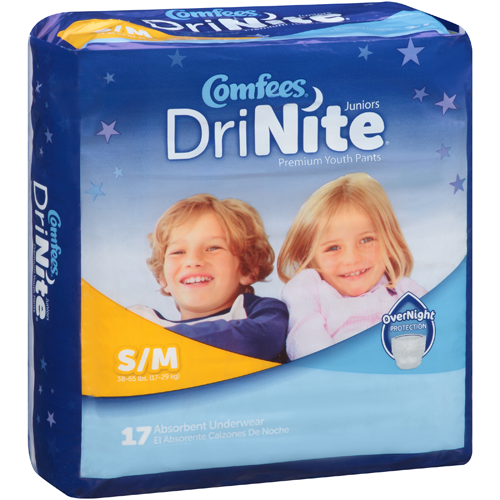 Comfees DriNite Youth Diapers, manufactured by Attends, are premium diapers for nocturnal enuresis, more commonly known as bedwetting. According to WebMD, millions of children wet the bed at night, so know that your child is not alone and that Domtar Personal Care has created an effective solution. 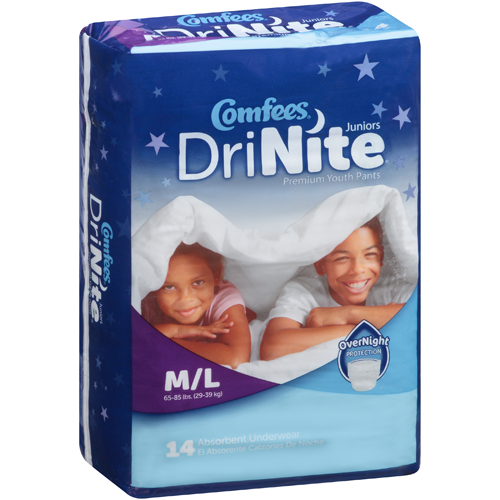 Comfees DriNite Youth Diapers feature a super-dry core that helps protect your child through the duration of the night. 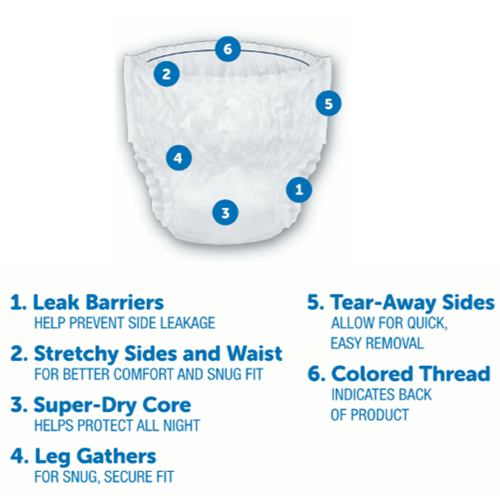 In fact, these bedwetting diapers integrate leak barriers at the gusset. If accidents do occur in the night, the leak barriers prevent urine from leaking out of the side. However, preventing spillage is only one quality of these premium diapers. To keep your child's mind at ease, you want him or her to be comfortable. Comfort is of utmost importance, which is Comfees DriNite Youth Diapers present stretchy sides and a flexible waist on the brief for a snug, yet comfortable fit. 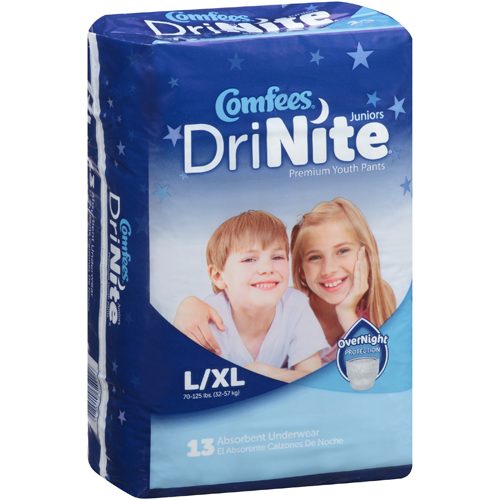 Comfees DriNite Youth Diapers feature tear-away sides that allows your child to quickly and easily remove the bedwetting diapers by tearing at the sides. 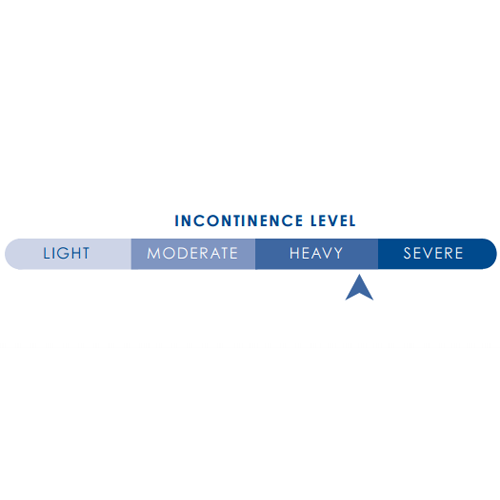 When your child is ready for a new diaper, the back of the brief features a colored thread so that the child can easily discern which which side is the back of the brief. 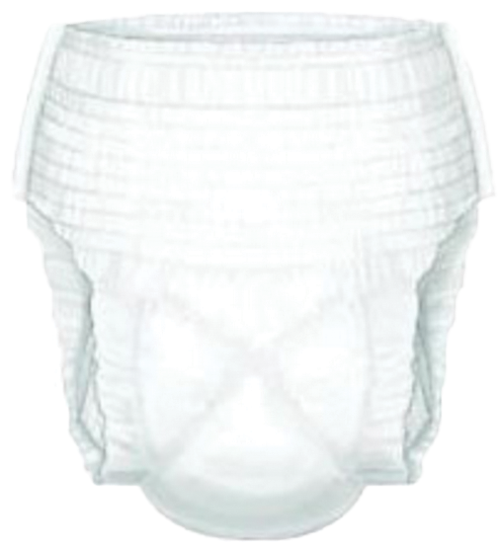 When children wear Comfees DriNite Youth Diapers, not only will they be comfortable, but their confidence will soar. Upgrade to the best diapers for bedwetting available on the market by ordering these youth diapers today! Super-dry core that offers all-night protection. Tear-away sides for quick and easy removal. Product Numbers: CMF-YS, CMF-YM, CMF-YL. 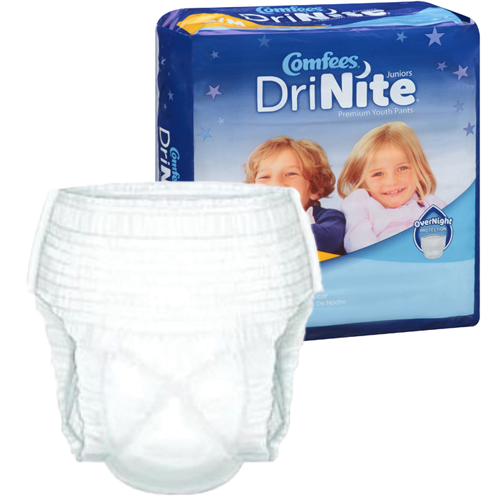 Application: Absorbent underwear to collect urine to prevent nocturnal enuresis (bedwetting). Fastener Type: Tear Away Seams. For a smaller youth size, try Comfees Baby diapers size: 7.
would you be willing to send me a sample to test these before I purchase a whole case? Hello Rhonda: Unfortunately we do not offer samples to customers. In order to possibly receive a sample of a product we carry, it's best to contact the manufacturer directly.